Shellfish have a bad but perhaps unfair reputation as vehicles for dietary cholesterol. Excessive dietary cholesterol is notoriously linked to cardiovascular disease risk, even though saturated and trans fats have a stronger effect on raising blood cholesterol levels. Though shellfish do have a high cholesterol content, this shouldn't discourage you from eating them as they are also a rich source of many beneficial nutrients. Shellfish, thought to be a major source of dietary cholesterol, actually contain less cholesterol than some animal products, including beef and butter. 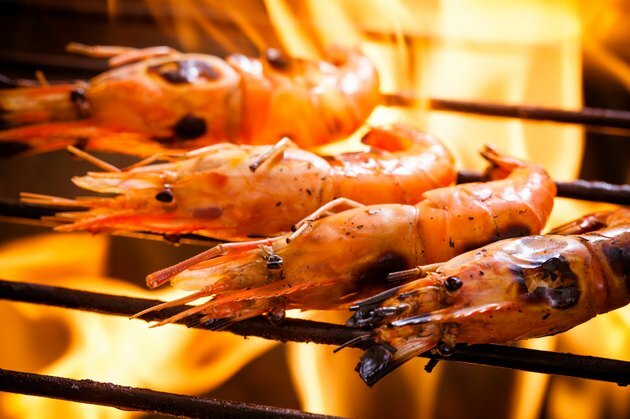 Cholesterol content ranges; shrimp, for instance, have high dietary cholesterol at 147 milligrams per 100 grams, compared to sea scallops at 27 milligrams per 100 grams. Shellfish are also lower in saturated and trans fats than other meats as well as a good source of healthy polyunsaturated fats. Some shellfish also contain significant amounts of other noncholesterol sterols that can decrease the absorption of cholesterol. There is a lack of evidence to suggest that shellfish consumption in healthy individuals leads to adverse health outcomes. A study published in the "American Journal of Epidemiology" in 2001 concluded that Chinese men who consumed fish or shellfish weekly had decreased odds of having a heart attack. Another study published in "The American Journal of Clinical Nutrition" in 2011 showed no adverse effect of shellfish consumption on risk for Type 2 diabetes. If you have heart disease or a genetic cholesterol disorder, you are more susceptible to the effects of dietary cholesterol and should monitor your intake. Shellfish, in addition to having lower overall fat and saturated fat than other meats, contain high-quality protein and are good sources of iron, zinc, copper, and vitamin B-12. These nutrients can be hard to acquire from plant foods, so people who eat seafood but no meat may benefit from eating shellfish. Keep in mind that shellfish are often prepared with lots of butter or deep-fried, which can adversely affect cholesterol levels. Using lighter vinaigrettes or limiting fatty sauces can be a heart-friendly alternative. Human cells generate the majority of cholesterol in the body, and dietary intake only contributes a small amount. There is no dietary requirement, and you should consume less than 300 grams of dietary cholesterol per day -- less than 200 grams if you have been diagnosed with heart disease. To keep blood cholesterol levels in check, monitor your intake of saturated and trans fats, which can increase blood cholesterol levels. What Is the Nutritional Value of Shrimp? Are Crabmeat & Shrimp High in Cholesterol?